The Universal Kicking Tee is perfect for high school and collegiate use with multiple height options. 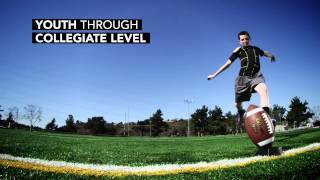 This allows the kicker to gradually transition toward kicking off the ground. The two durable rubber pieces can be configured in four different ways; as a solo kick-off tee for regular or on side kicks at 1 inch or 1.75 inches, or as a kicking block for field goals with a holder at 1 inch or 1.75 inches.